The MSS Time Calendar is a useful tool for managers and supervisors. It allows view/review of reported and payable time, including time details, for one employee or a group of employees. From within the Weekly Time Calendar, the view can be switched to Daily Time Calendar or Monthly Time Calendar to have either of those views. It does not take the place of the Approve Time and Exceptions pages. This procedure provides steps for using the MSS Weekly Time Calendar. Access the Weekly Time Calendar page through menu path Manager Self Service > Time Management > View Time > Weekly Time Calendar. Supervisors and managers will access this page through the My UW portal. Please refer to user procedure TL - Navigation in Time and Labor for instructions. Select employee by entering Empl ID or Last Name/First Name, or select a group of employees by entering a broader criteria. See TL - Employee Search Options for additional search option details. Before or after clicking Get Employees, choose the date you wish to view. Note: the default option is a Week view so in most cases you would select the day of the week on which Sunday falls. 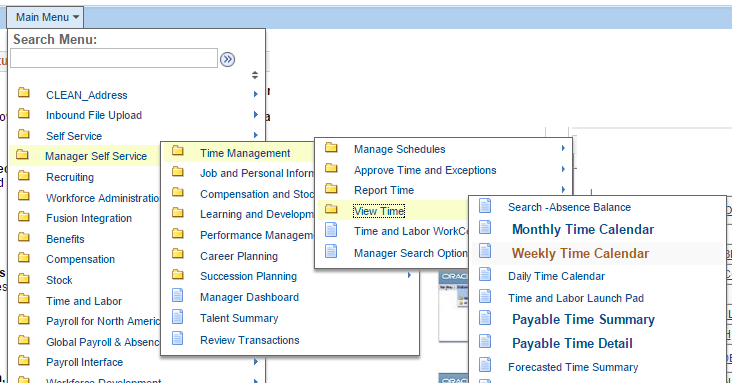 If you change the week view after clicking Get Employees, click the View Week button to refresh the screen. Select Payable hours (this will show all hours that have been processed through the Time Administration process). By selecting reported hours, you will only view the raw hours as reported and the time that has been processed through Time Administration. The employee's payable time for the week appears. To include Absence takes in the utility, select the Show Absences check box in the View Criteria selection options. 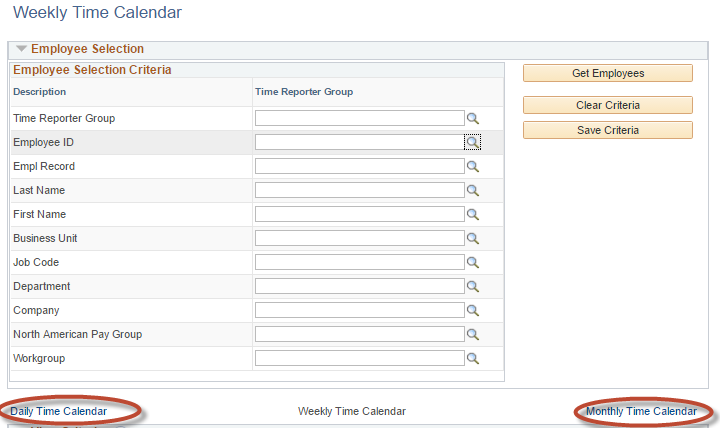 To show Holidays during the time period, select the Show Holidays check box in the View Criteria selection options. Select a week which includes a Holiday. Then select the View Week button to refresh the screen. The Legal Holiday is shown on the Calendar. To view any Exceptions which exist for the employee's time, select Show Exceptions in the View Criteria selection options. The Exceptions hyperlink appears to the left of the week's dates. Click the Exceptions hyperlink. You are taken to the timesheet Exceptions page. From this page, you can allow the Exceptions or leave them for later review. See TL - Review and Approve Exceptions for detailed instructions on cleaning up exceptions. To view the Reported or Payable Time details for a specific date, click a date's hours hyperlink. The details page for 01/17/2017 opens. On the details page, you will view whether the reported time was submitted through an Elapsed or Punch timesheet. In the example above, the Punch timesheet's In, Meal, In, and Out punches are shown. No Exceptions are listed for the example date. In the Payable Time section, the day's total hours (8) are all Time Reporting Code "Reg Hour", the Status shows the Payable Time needs approval, and the Estimated Gross payment for the day's time will be $180.888. After viewing the detail information, click Return to Calendar to return to the Weekly Time Calendar. Time may also be viewed by day or by month. From the Weekly Time Calendar, select the Daily Time Calendar or Monthly Time Calendar link. You are taken to the Calendar of your choice. Select an employee or group of employees in the usual manner and choose the day or month of interest. Click Get Employees or View Day or View Month, depending on the calendar you are viewing. The same View Criteria options and navigation choices are available in the Daily and Monthly Time Calendar which exist in the Weekly Time Calendar.